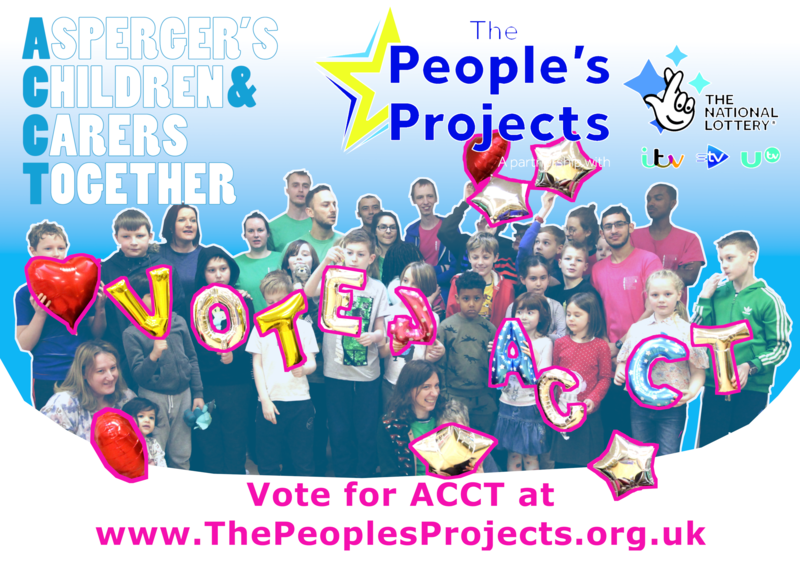 ACCT are excited to announce that the National Lottery have recognised our work and made us a finalist in The People’s Projects. There are five finalists all competing to win £50.000 of funding, the winners will be decided by a public vote. Our campaign video can be viewed at the link below. Voting is now open and closes on Monday 15th April at midday. ACCT needs your help. Do you know 10 people who you can ask to vote for us? Go Team ACCT! Help ACCT to win £50K! ACCT co-founder, Deborah Woodhouse suddenly and tragically lost her husband, David, on 13th March. For those who don’t know her I just wanted to highlight the tremendous amount of work Deborah did for ACCT, supported by David as well as the work he has done for Sheffield. Without Deborah, ACCT would not exist and, aside from supporting her in this work, David influenced donations made by Henry Boot, including the iPads for the annual raffle. David also worked on site improvements at Work Limited, which provides life skills and occupational training for people with learning disabilities, was involved with the building of the hydrotherapy pool at Ryegate and took part in fundraising activities for Sheffield Parent Carer’s Forum. In 2016 he was in charge of the logistics of getting the elephants placed across the city for The Herd of Sheffield, which raised £410,600 for Sheffield’s Children’s Hospital. In order to do this, he had to get up in the middle of the night every day for 2 weeks. One of the mini elephants was named Dave after him and it will be attending his funeral on 12th April. Last year, David was sponsored by Henry Boot to take part in Bangers & Cash, an auction and rally to Monte Carlo, which raised money for Roundabout, a Sheffield charity for youth homelessness. Personally, I knew David as a warm and kind man who remained calm through whatever life threw at him and worked tirelessly for his company (Henry Boot), the local community and his family. One of his final gifts to Sheffield will be the donations raised in his name for ACCT and Sheffield Parents Carer’s Forum. His death is a tragic loss for Deborah and her family, but also a loss for Sheffield. David Woodhouse, loving husband, father, brother and uncle. Also Chartered Surveyor and Builder at Henry Boot Construction, Sheffield Wednesday supporter and a friend to many. Please join us for this informative presentation. We have made the decision to cancel our football session this week due to the freezing temperatures. Their presentation and discussion will be reflective with a focus on supporting mental health. To include their roles within ACCT, their professional training and the benefits of ACCT, and the influences of media, social media and mobile phones. They will look at ways of managing these areas positively. There will be a presentation of everything that ACCT achieved in 2017 – 2018 as part of our AGM. Please join us for this informative evening and meet the ACCT team. Everyone welcome, new members can register on the night, refreshments provided.